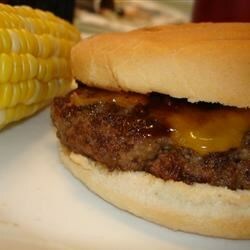 "These are spicy burgers cooked on the grill and topped with a hot barbeque sauce. Serve with hamburger rolls, lettuce, tomato, and red onion." In a medium bowl, mix the ground beef, bread crumbs, egg, green onions, 1 tablespoon Cajun seasoning, and mustard. Form into 4 patties. In a small bowl, blend the barbeque sauce and 1 teaspoon Cajun seasoning. Lightly oil the grill grate, and cook the patties 5 minutes per side, or until well done. Place a slice of cheese on each burger, and allow to melt. Serve with seasoned barbeque sauce. These were fantastic. Didn't make any changes from the original recipe, and they turned out great. Just spicy enough, with a great flavor. As with all recipes, the seasonings make all the difference. I used a very spicy blackening seasoning and these turned out great!! Serve on an English Muffin. I changed the ingrediants ever so slightly to suit my taste buds.Yet to use the recipe as is quite good and vetry good. Wow are these hot and spicy! We used a cajun spice recipe from this site and these burger came out tender and juicy. Wow, talk about juicy burgers. These are great. I used Emeril's Essence so they were lot all that spicey. I will make again because they have a lot of flavor.